Click below to hear the show! 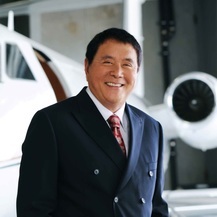 Robert T. Kiyosaki is best known as the author of Rich Dad Poor Dad. This is the #1 personal finance book of all time, which has challenged and changed the way tens of millions of people around the world think about money. His book title holds four of the top ten spots on Nielsen Bookscan List's Lift-to-Date Sales from 2001-2008 alone. In addition, Robert has been featured on shows such as Larry King Live, Oprah, The Doctors, Bloomberg International Television and CNN.